To prepare bread pizza , we need neither pizza base nor cheese here. 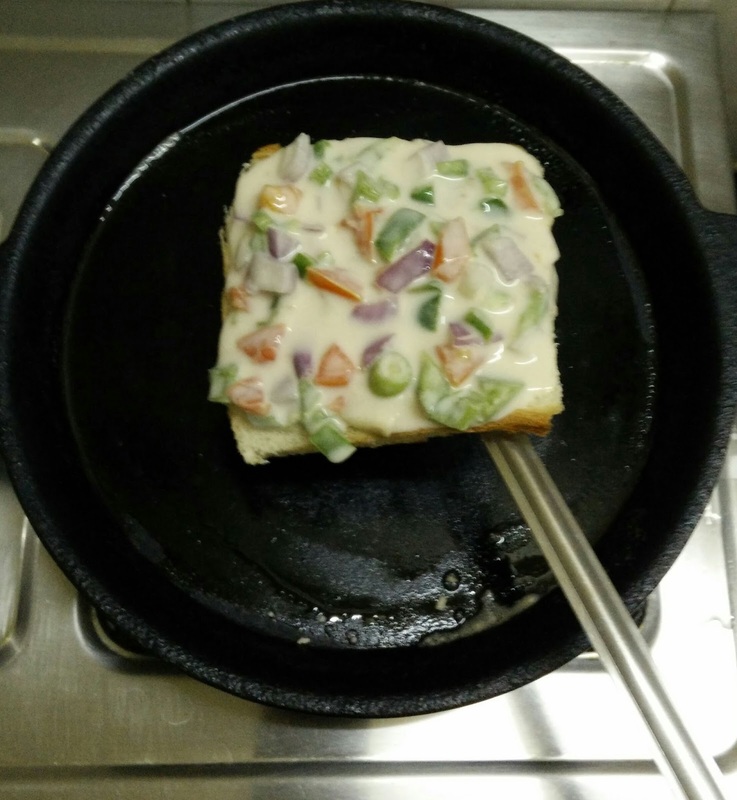 Also we will use dosa pan/tava instead of oven. Sounds interesting ...isn't it ? 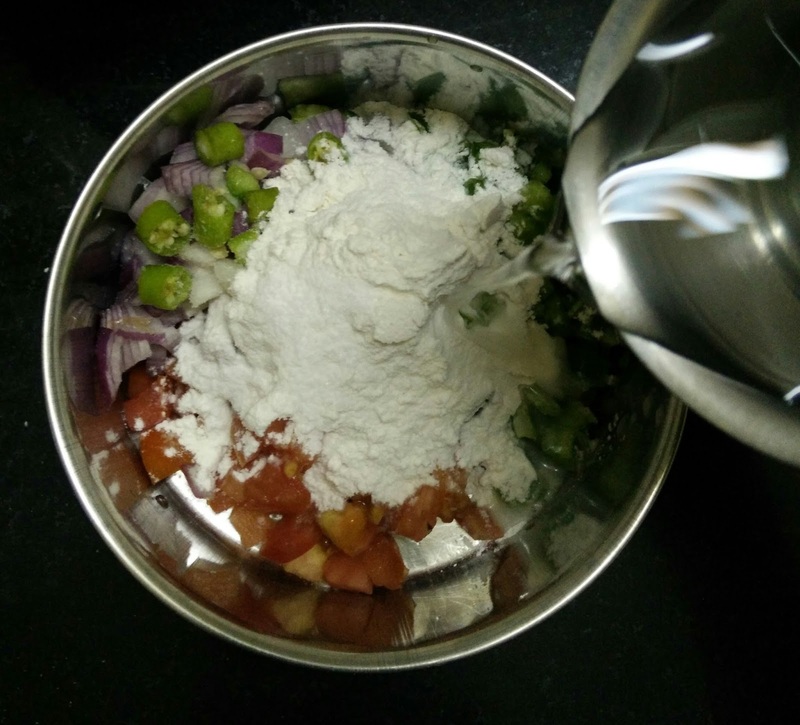 Chopped capsicum, tomato and onion will be mixed with all purpose flour and salt to make a thick batter first. 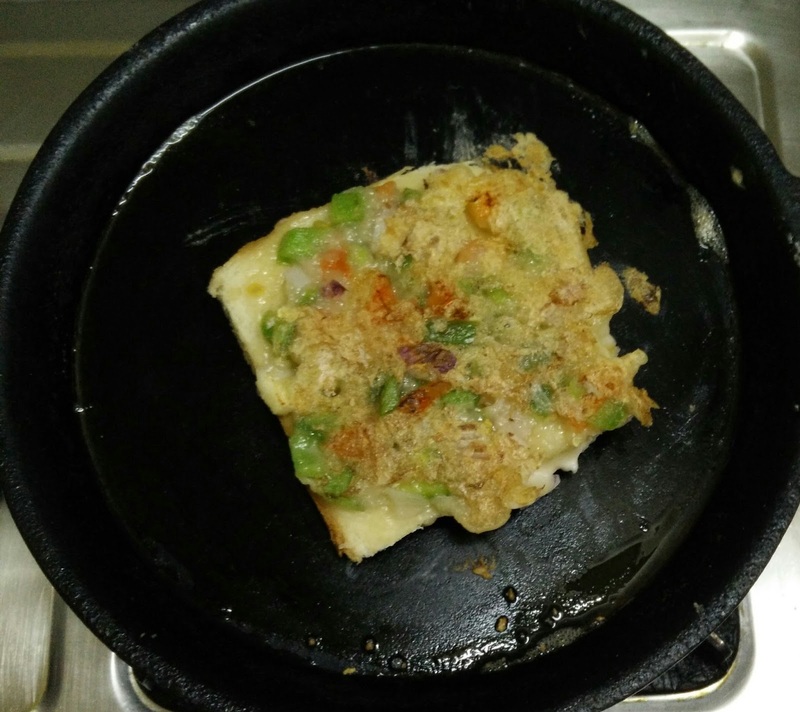 This batter will be poured on both sides of the bread and shallow fried on dosa tava. 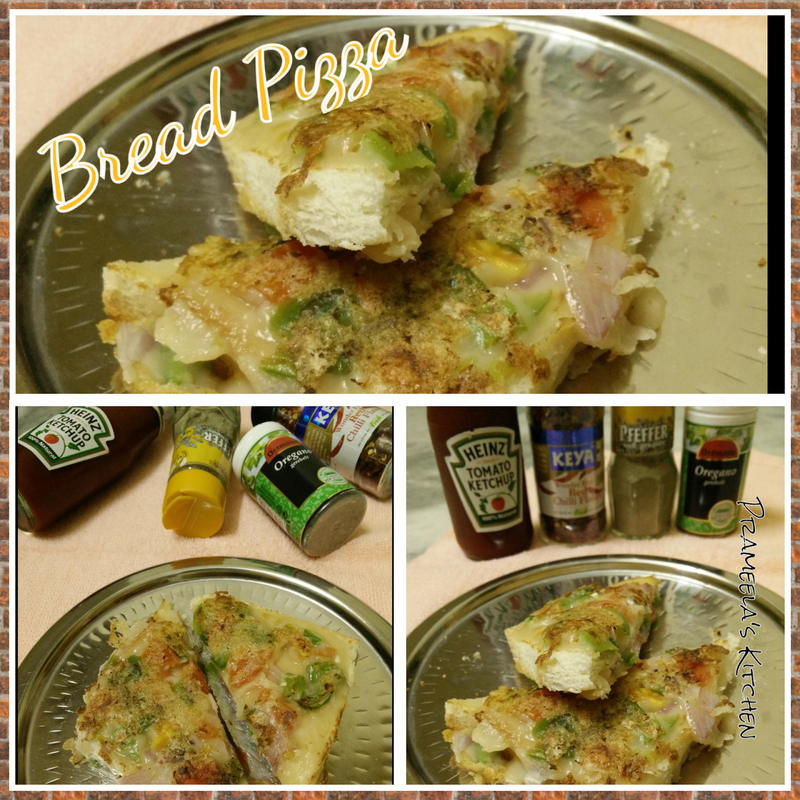 At the end top up the bread pizza with all the pizza seasoning as per your taste before you serve. 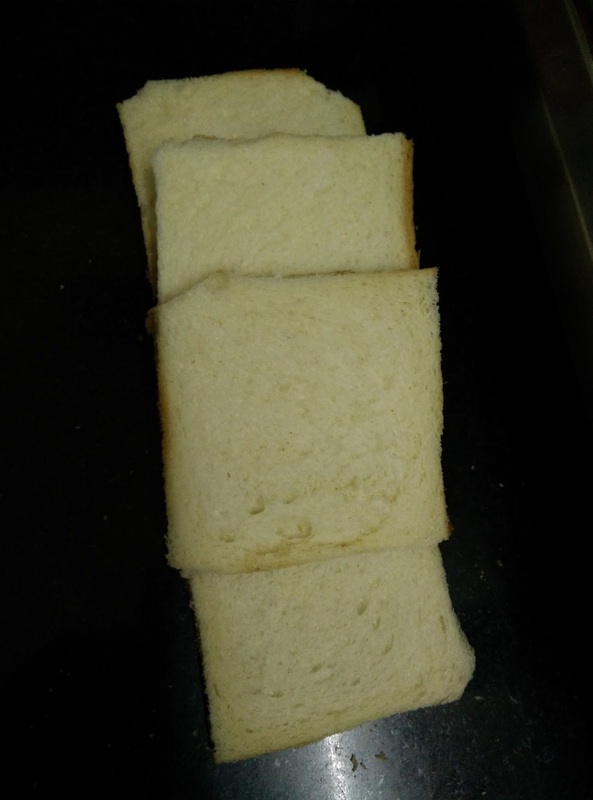 Remove edges of sandwich bread and keep it ready. Transfer the chopped veggies, green chilly, salt and 6-8 tbsp of all purpose flour into the mixing bowl. 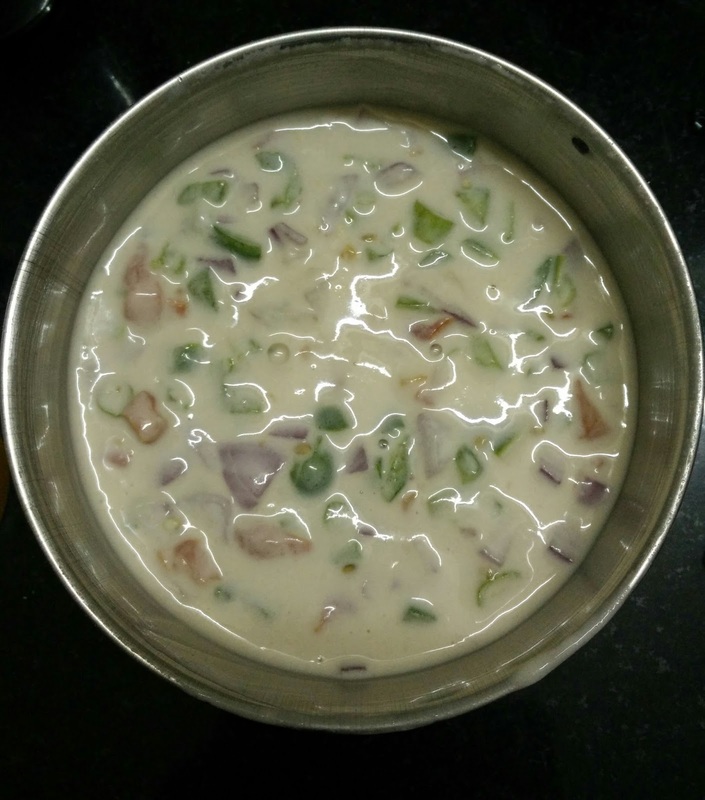 Prepare a batter of consistency (like pakoda batter consistency, neither runny nor very thick ) by adding water little by little. keep the batter aside. 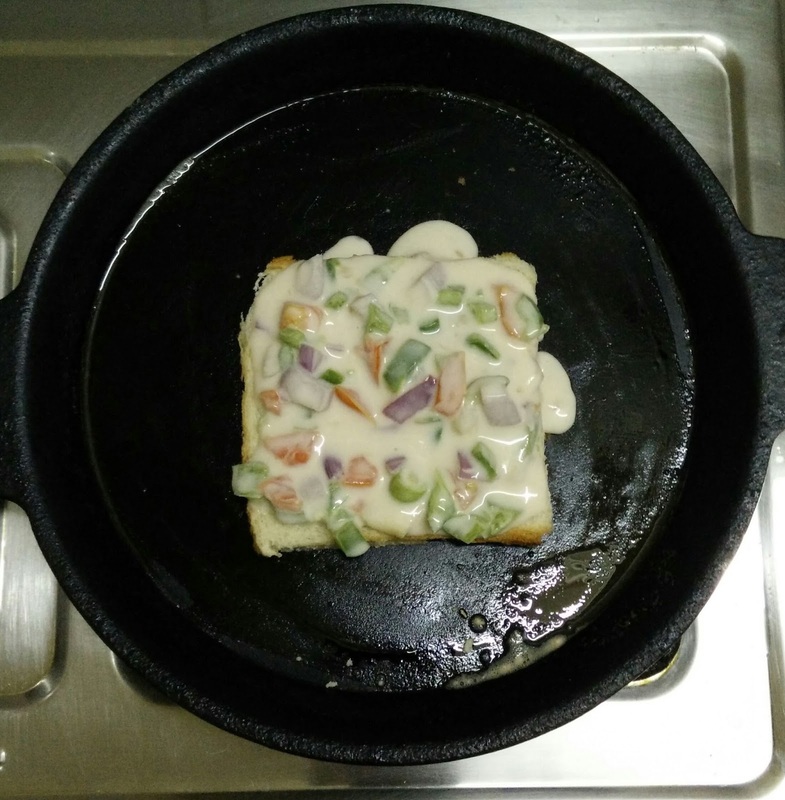 Heat butter in a dosa tava and place one slice of bread on the tava. ( Keep the flame in low-medium).After 5-7 secs, flip the bread for the first time. 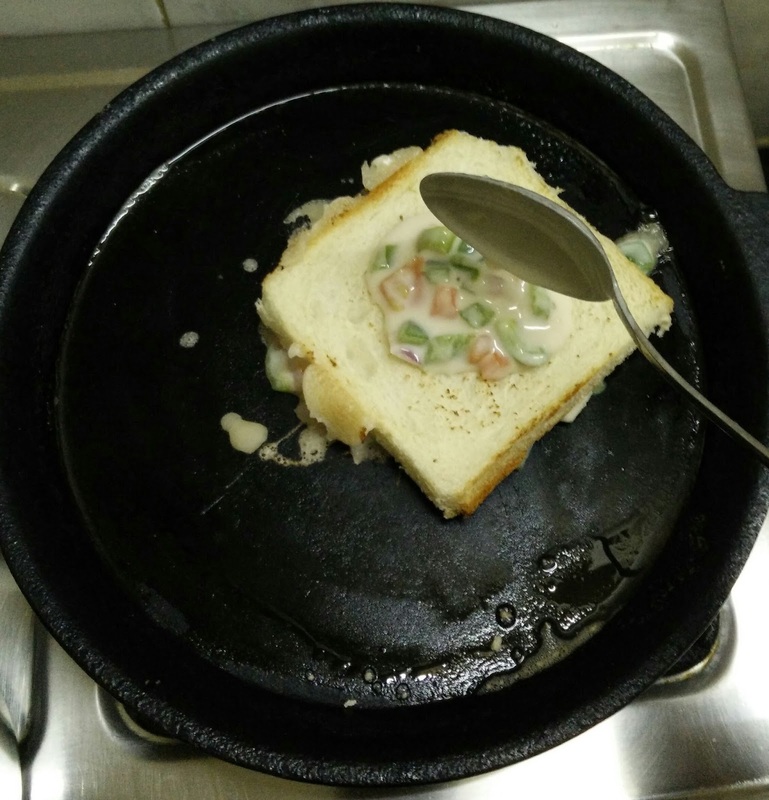 Now, take a small ladle full of batter and pour on top of the bread to cover the area completely. 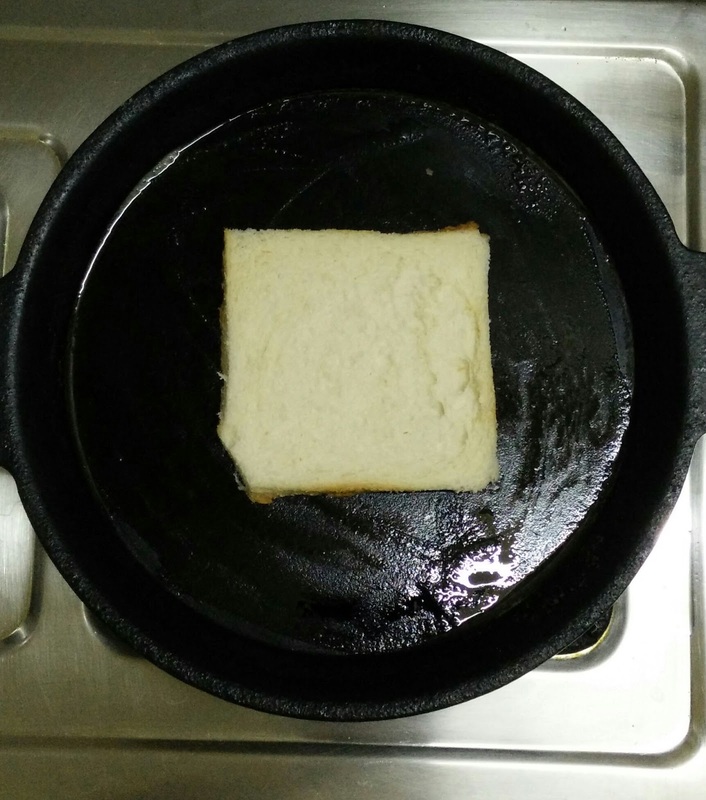 Slowly lift the bread and flip it for the second time. 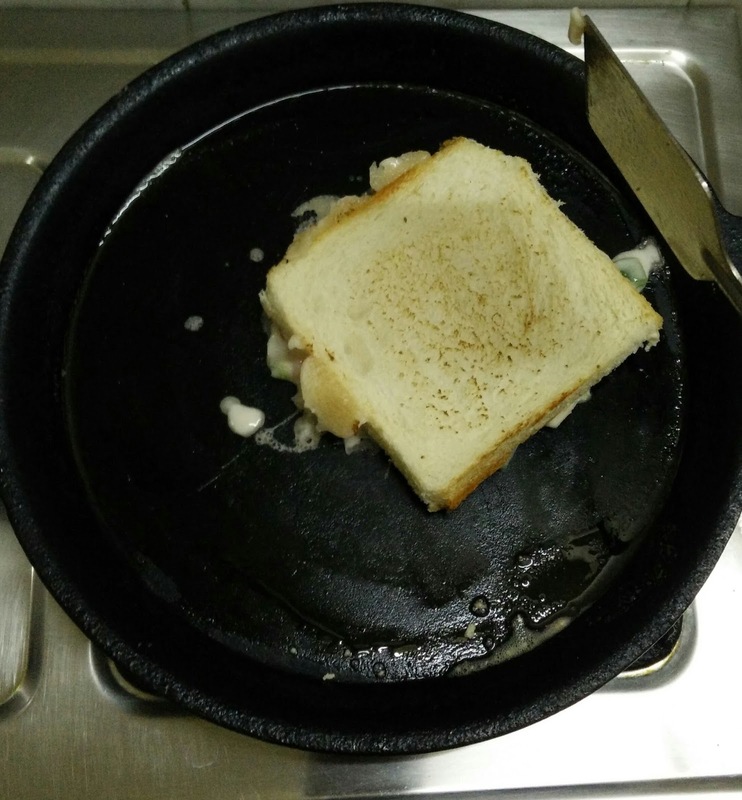 Now, take a small ladle full of batter again and pour on the plain side of the bread to cover the area completely. After the down part of the bread cooks completely, flip the bread for the third time. Wait until batter and veggies cooks well at the bottom. If required add butter in between. 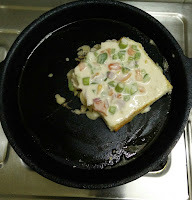 (I have used minimum amount of butter as you see in the pics). 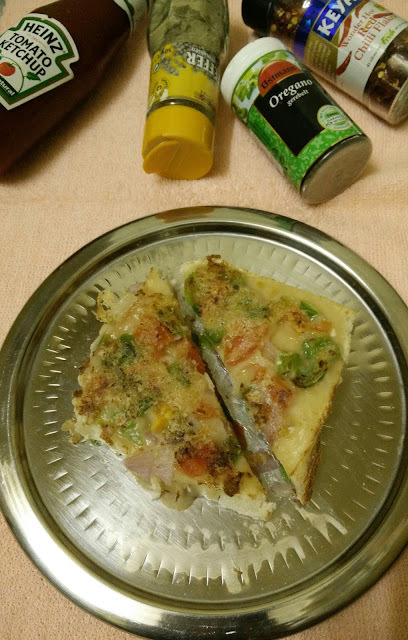 Take out the pizza from the tava after it turns golden brown on both the sides.Cut it to make two triangles. Repeat the same steps to finish of your batter. 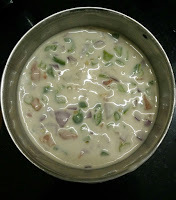 Serve hot along with seasoning like,oregano,red chilly flakes,white pepper powder and tomato ketchup. 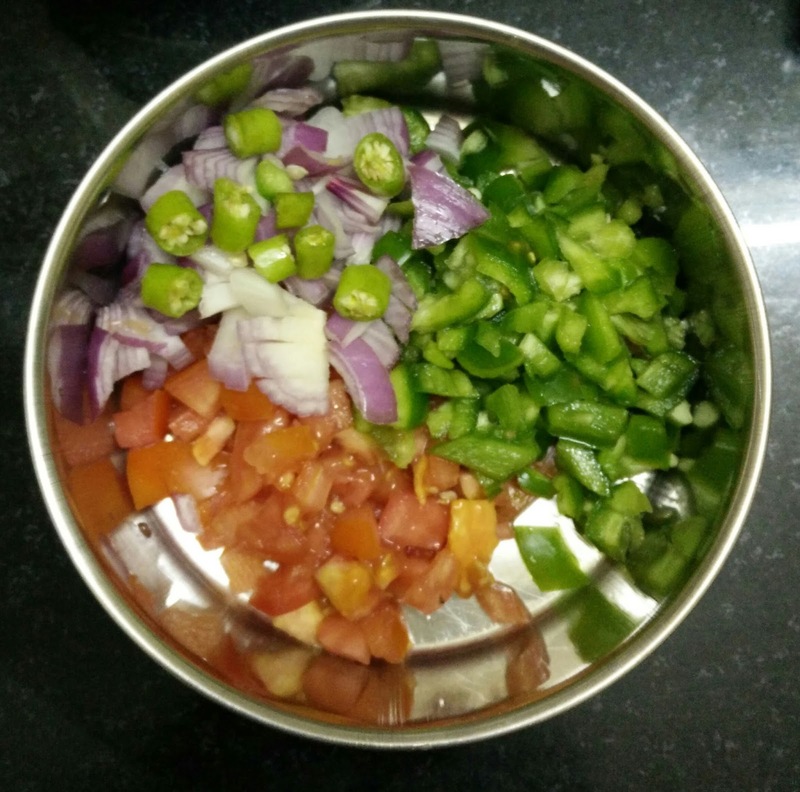 You can skip capsicum if you do not like . Also , you can omit green chilly if you do not like. 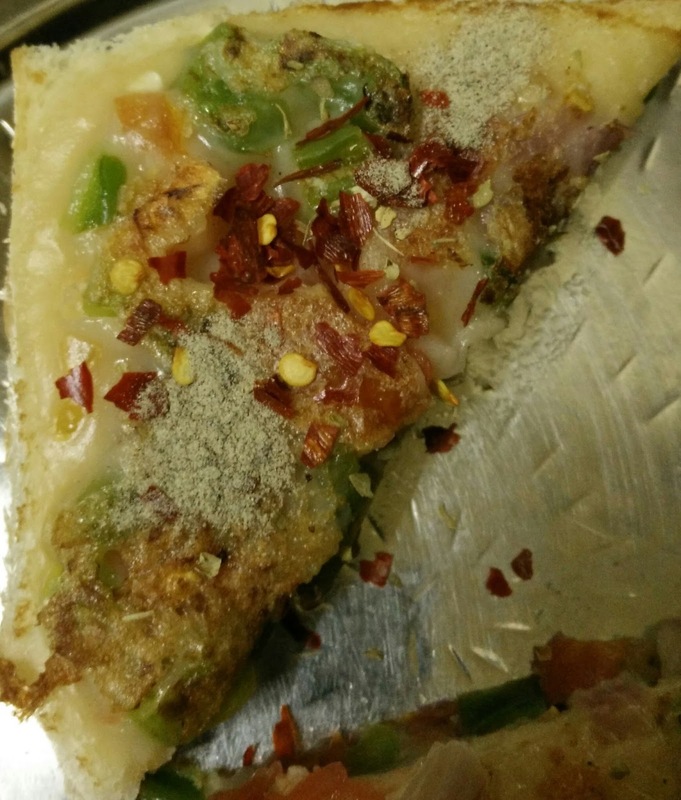 Add more of red chilly flakes on top while you serve. We can make vegan pizza , if you use olive oil instead of butter and use vegan bread instead of normal bread. Non stick pan will be good for this recipe. 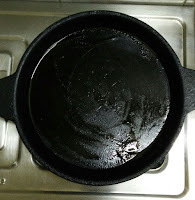 From last four months, I do not use much of non stick pan/kadai in my kitchen as it is not good for our health. 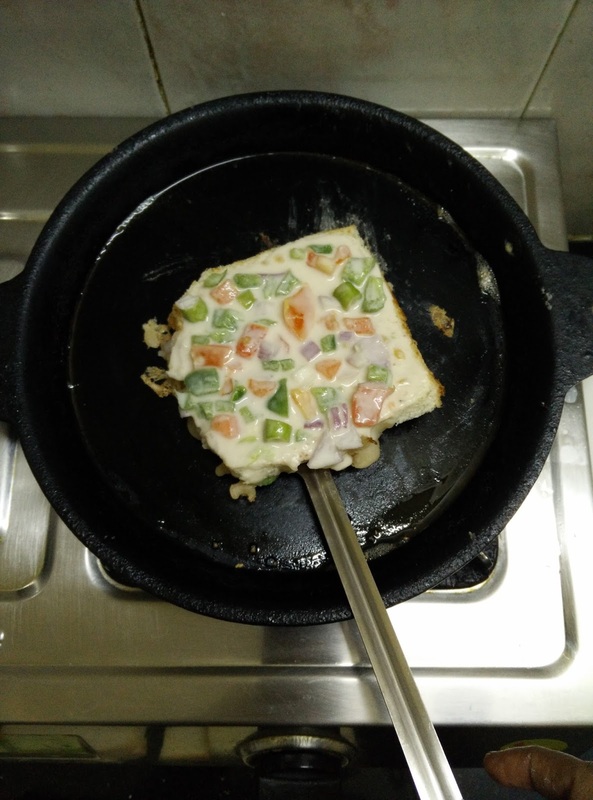 So I prepared in iron dosa pan only !! !